I thought it was about time to write my take on the most famous overdrive pedal ever: the Ibanez Tube Screamer. 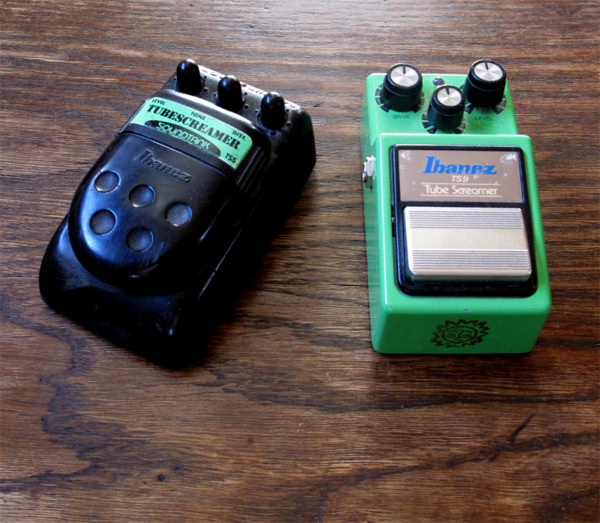 Used against a clean amp, a Tube Screamer will go from a bluesy to classic rock tone that will cut through the mix thanks to a mid-range hump (check out my videos below). Used against an already overdriven amp, or even another overdrive or distortion pedal, it will push your tone and will give it more body and sustain. This trick was used by numerous rock and metal players in the 80s, before high gain tube amps arrived. There is a lot of historical resources about Tube Screamer pedals on the internet, the best being probably Analog Man’s Tube Screamer page. I will give you a short rundown here. 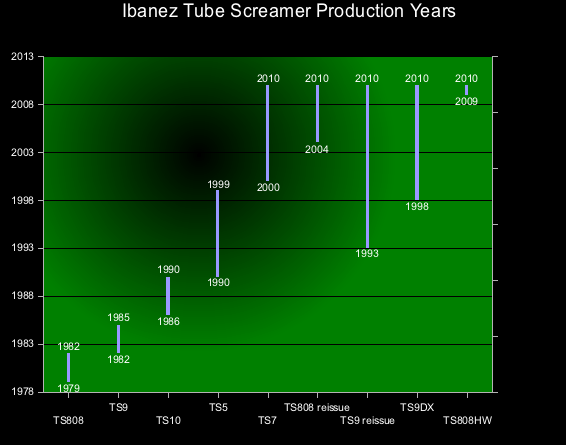 The first incarnation of the Ibanez Tube Screamer was called TS808. It was launched in the late 70s as a relatively cheap offering and promised, like every other overdrive and distortion pedal, to give you “the natural overdrive of a good tube amplifier”. As always, everybody was very skeptical but in that case, it is not far off at all! The Tube Screamer became a piece of choice in the rig of numerous pro players and of course the most famous of them at the time was Stevie Ray Vaughan, who, at some stage, even used two Tube Screamers in series! 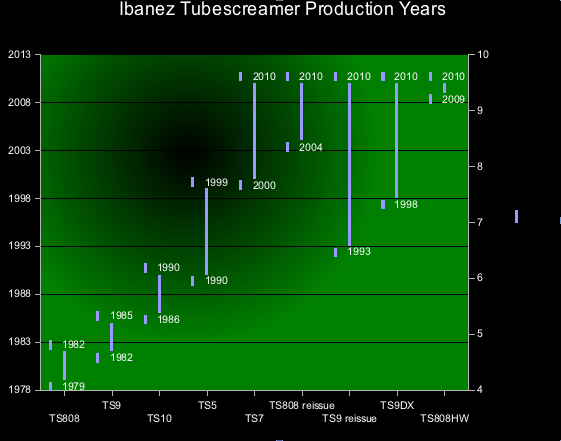 This means that, as of now, Ibanez is selling 5 different Tube Screamers: the TS808 reissue, TS9 reissue, TS7, TS9DX and TS808HW. The early TS808 models made between the late 70s and 1982 have become absolute collector items which explains why Ibanez has decided to bring this model back. Because of its circuit and the chips used for its manufacture, it is considered the “best sounding” Tube Screamer. The TS9 has its followers, it is a bit brighter than an 808 and was the first “old model” to be reissued in 1993 and more importantly the only one available until 2004. This explains why guys like Analog Man were and are still modifying TS9s to bring them to TS808 specifications using carefully selected components (have a look at Analog Man’s website for the technical details). The mod market has not been killed by the release of the TS808 reissue in 2004 as these are still considered in some ways inferior to the modded TS9s. The TS7 is a cheap alternative and is part of the tonelok series of effects. I had the chance to try one and it does not sound bad at all. It even features a “more gain” mode that the others don’t have. The TS9DX was launched in the late 90s as a “super Tube Screamer” offering more sonic possibilities. It can be modified too. The TS808HW is a very recent model and is supposed to be a TS808 with even better components. Is it a gimmick or not, I could not say but this is clearly a response to all the modders and clone makers. On top of these currently made models, the discontinued TS5 and TS10 can be found more or less easily but the original TS808s and TS9s from the early eighties are very rare and expensive. To make things more complicated, Ibanez, especially in the late 70s and 80s, were in a pedal making frenzy and some of their more esoteric models are more or less related to the Tube Screamer in their conception. I am thinking of the SD-9 or the strange SM-9 which is a bit of a metal Tube Screamer. Mind you these are a departure from regular Tube Screamers but can be interesting nonetheless. Finally, I must mention that a lot of of “boutique” overdrive pedals are Tube Screamer clones with a twist to make them more appealing than the original one (see the “Clones and components” section after the videos). Which Tube Screamer should I get? First off, I would say that I own a TS5 which was the cheapest Tube Screamer ever made. Although it does not sound as good as a TS808 or a modded TS9, it does give you a taste of the Tube Screamer tone. It is said that Stevie Ray Vaughan used several models including a TS-10 at the end of his career which gets to show you that you don’t need a TS808 from 1980 to be cool. Now I think that the safest choice for a reasonable amount of money is either an Ibanez TS808 or a modified TS9. I personally own an Analog Man modified TS9 and it sounds very very sweet as you will see in the videos below (check out the link for purchase information or go straight to www.buyanalogman.com). Mind you, they are not cheap pedals and I would understand if you’d go for a TS-7 as these are less than half the price of a TS-9. I have seen TS-7 for about 50€ whereas a TS-9 is about 120€ and a TS 808 149€. As to an original late 70s/early 80s model, I think we have now reached the point of irrationality in terms of pricing, these are collector items. If you have the money and the will to find one, go for it but I would not say it is indispensable. Again, check out Analog Man’s Tube Screamer History page if you are in the market for an old one as there is a lot of details which should help you identify a true vintage one from an almost vintage early 1990s reissue. Be warned about one weakness that all these old Ibanez pedals share, it is the switch! The switch of my TS-5 has become very flaky and I have the same problem with my SM-9. These switches can be replaced but if you don’t have the know how, you will have to find someone to do it. Well I will now try to demonstrate why the Ibanez Tube Screamer is so sought after and why you might well end up adding one to your rig if you haven’t done it already. First, with a Strat, it can do the Stevie Ray Vaughan tone as well as some more classic rock tones. Alas, it will not give you SRV’s fingers and there is obviously more to his tone than a Tube Screamer but I find you can get pretty close. In this video, I play my American Classics Custom Shop Strat equipped with noiseless Kinman pickups. The guitar goes into the Analog Man modded TS-9 Tube Screamer and a Fender Silverface Champ. I show various drive and level settings. At high level settings, the pedal is pushing the amp into breakup, pretty cool! The amp was close miked with an SM-57 and some reverb was added in Cubase 5. At the end, I show briefly what it can do to a distortion pedal (a Pro Co RAT 2 in this case), namely increase the sustain and add some fatness. I don’t share the opinion that a Tube Screamer is not very well adapted to Humbucker pickups. My theory is that people say that because the Tube Screamer lets the tone of the guitar through and a Humbucker based guitar will obviously sound totally differently from a single coil based one. You will not get the “quack” of a Stratocaster of a Telecaster but it is interesting nonetheless. And I am talking about using it against a clean amp because against an overdriven amp, a humbucker guitar and a Tube Screamer are an excellent match (ask 80s metal guitarists…). And because a post about the Tube Screamer would not be complete without mentioning the JRC4558D op-amp chip that was used in the TS808, you will have to know that some of the original TS808 were not made using the JRC4558D but another cheaper alternative called RC4558P and these still sound great. Anyway, this chip is one of the major differences between the TS808 and the reissue TS9 so for the latter, the mod consists, amongst other things, in replacing the existing chip with a JRC4558D. I will stop here on the subject as I am not a specialist in electronics and there are entire websites devoted to this issues such as here and here. Finally I know that I mention Analog Man a lot in this post, it is only because he is the original Tube Screamer modder and stick to a pure vintage tone philosophy. The other famous modder, Robert Keeley, seems to have less of a pure vintage approach in his Tube Screamer mods which does not mean they are bad at all but I don’t have first hand experience with those, hence will keep my big mouth shut. There is much more to say about Tube Screamers and I will post follow-ups but I hope you will get from this post why this is such a popular pedal. Actually, to me, it is almost like the natural extension of any electric guitar. So, if you don’t have one, check it out! If you have any questions or remarks, feel free to leave a comment. I think every guitar player need to use this Screamer.Me also use every time Ibanez Tube Screamer if i play blues,rock,metal really good combination is use screamer with good delay.If you need a good tone this is combination your amp+screamer+good delay for sustain this is the best i think.Thanks for the history, interesting for me to read.Videos is really good i see skilled guitar player who played with nice sound and know how work`s with equipment.Best wishes from Raymond. Nice summary, great playing. I have to asy, are you Maori? No I am not, I come right from the other side of the world. the brigde , I play it more than my strat because it sounds AWESONE also. I get the Stevie Ray Tone out of it, So TS 808 And TS9 Together with fender blues junior amp.. The TS5 is closer to a TS9 than you´d think. It´s only two resistors different. change them to the right value, stick in a JRC4558 or similar, and you got an original TS9 – in cheap. i don’t really think that the JRC chip has to do with the sound. The chip is just an op amp and doesn’t really play so much about the tone of a tube screamer. The difference is the other components used. The TS808 used much better components (resistors, capacitors) with better accuracy. If you study electronics, the accuracy of resistance and capacitance in an amplifier would determine the quality of sound. I have done an experiment before using breadboard cloning a TS808 and using different types of op amps and resistors. Changing the op amps didn’t do much difference on the tone, but changing resistors with higher accuracy did. Try watching Visual Sound blind demo of their Route 808. 🙂 my two cents. Hello, I use a Maxon OD-9 which sounds fantastic. It’s based on a TS-9 with better components and true bypass. I highly recommend it! thanks for your review. I did get ts9 mod to 808/analogman-not silver mod. ( (early 90’s ts9 I think)and running les paul trad pro thru plexi reissue 100w into 1936 cab (lead series 800). Plexi channels jumped out, 3 on high, 4 on low, real ballsy,plenty of gain and sustain w/o having to attenuate plus won’t blow the 2x12s. Paid extra for switch change, KWS road upgrade. Nice w tele too. glad I did it. This mod (http://www.sevenstring.org/forum/sevenstring-org-workbench/103276-tech-pimp-your-ibanez-ts5-tubescreamer.html) to the TS5 works. Instead of paying hundreds of dollars for an 808 spend $20 on parts and you’ll have an excellent tube screamer ts5 pedal. Hi! Thanks for the great article on Tubescreamers. I don’t know if I missed it but I didn’t notice many mentions on TS10. Do you think it’s any good Tubescreamer? I am using TS10 with BOSS GT-100 Marshall or Fender amp models and it sounds great. I also use TS10 with Real tube amp Orange AD5 and it sounds great too. I’ve heard some complaines on TS10 sound but with my gear it sounds great. What are your experiences on TS10-version? I am an amateur guitarist from Finland and I enjoy reading articles like this one. Keep it up!